Why and how are the financial markets in the first place in conflict with human rights? Well, to answer that question properly one has to look at the big picture. Certainly financial markets can and have negatively affected human rights, but they have also had positive impacts. Global aggregate wealth has grown exponentially in the last 30 years. Levels of extreme poverty has dropped precipitously everywhere, especially in the poorest countries (China’s poverty levels have dropped from 89% in 1980 to less than 2% today), and access to basic financial services has expanded worldwide. Alongside the human rights benefits of better health, education, safety and security that such wealth brings, it also offers people greater promises and possibilities of a ‘good life’ for themselves and their children. However, in lock step with these benefits our hyperbolic financial system has also created enormous human rights problems. There are egregious and still growing wealth inequalities between and within countries and a finance system that is increasingly focused on value extraction rather than value creation, where the money markets are used primarily to make more money rather acting as vehicles to funnel investment into the real economy to create tangible products and services (as well as jobs and tax receipts). The overweening economic power of the financial system has turned into political power through the sector’s capture of governments, resulting in skewed rule-making that privileges capital and the already wealthy (eg. taxation), protects financiers (implied bank guarantees and regulatory agencies as toothless tigers), and permits rent-seeking on a colossal scale (through inflated transaction costs and interest rates), have all contributed to suffering, loss and degradation. The fact that the worst of these indignities are nearly always visited upon societies’ poorest and most marginalized communities – in other words those least able to afford it – is morally reprehensible when global aggregate wealth has grown so massively and that of the world’s top 10% (let alone the top 1%) has accelerated out of sight. It is also economically reckless and socially unstainable as it represents a failure in political leadership that ought to be catering for all of society, not just its elite. History bodes ill for all political system that fail to heed signals of such pervasive inequity and rank injustice. How hard is it to make finance more ethical in its role as a social utility in a time of increasing marketisation of all aspect of life against the background of the prevailing neo-liberal orthodoxy? Among the many intriguing responses to the book was one from a self-declared ‘finance specialist’ whose fundamental disagreement with the book’s thesis boiled down to their assertion that morality and ethics have to be kept out finance. Now therein lies nub of the problem we are facing. Senses or moral propriety and standards of ethical conduct are (or ought to be) fundamental features of any financial system. Not only to ensure that the system functions in ways that meet societal expectations, but also to establish and maintain the very foundations upon which the system stands – namely, that finance earns public trust, submits to political accountability, and delivers economic security. If we are to exploit the potential that greater financial wealth and the broadening financial inclusion can bring to individuals and communities, while at the same combatting the deleterious impacts of its excesses, then it is essential that the financial system embrace and promote a culture of social service for public benefit, alongside its enticement to reward effort and enterprise through private gain. In other words a balance must be struck between public and private interests. That requires leadership and responsibility both from within finance itself and from the political system and governmental institutions without. Finance’s cultural imperatives and incentive structures of hyper-competitive avarice, socially heedless introspection, and financial exceptionalism (exemplified by the epithets of being ‘Too Big To Fail/Regulate/Convict’), have to be replaced by deeper and wider recognition and acceptance of the imperative to serve society as well as oneself. No less than Adam Smith – the Doyen free-market liberalism – was convinced that the prospect of private gain was indeed the most powerful motivating force in a market economy, but that its utility is as a means to an end, not as an end itself. And the end to which such selfish enterprise must be put, in Smith’s view, is to fulfil wider social needs, especially those of the poorest and weakest in society. So it is, or should be, with today’s free and highly financialized market economy. In your new book, you mention the severe austerity measures taken by the EU officials as a violation of human rights in the euro area several times. Yet the restrictive fiscal policy is anchored in the EU’s Stability and Growth Pact at all costs. Is it worth to save the euro against this background? Monetary and fiscal policies associated with the Euro are many and broad, so any question of ‘saving the Euro’ cannot be answered by looking solely at whether and how it impacts human rights. That said, the social contract between the government and all whom it governs demands that the best interests of society as a whole be protected and promoted. Of course the ways that demand can be interpreted are various, but at the very least the interests of the poorest and the most marginalized – that is, typically, those more likely to be dependent on social welfare - must be given a high priority, precisely because of the vulnerability of their economic circumstances and fragility of their human rights protections. Yet, following the global financial crisis in 2007/8, it is especially striking how little human rights standards, and the legal as well as moral obligations to uphold them, played in discussions about what to do to about the crisis and its fallout. For example, remarkably, in a 3,500 word communique from a G20 summit hastily convened at the height of the crisis there is not a single mention of the words ‘human rights’, let alone any consideration of their relevance to the unfolding situation. In fact, human rights concerns should always be a part of debates over the interactions and balances between welfare economics and financial policy-making (both fiscal and monetary). The fact that they so seldom are expressly considered, even in such strained and chastening times as we experienced during and after the 2007/8 financial crisis, demonstrate very clearly how much bridge-building work needs to be undertaken to bring the interests and responsibilities of finance closer to the needs and obligations of human rights. David Kinley is Professor and Chair in Human Rights Law at the University of Sydney, and Academic Expert member of Doughty Street Chambers in London. 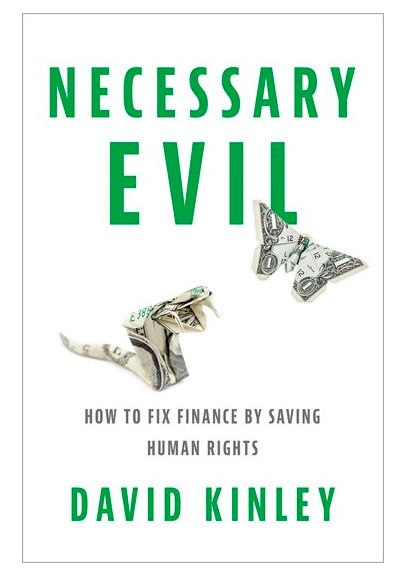 His new book “Necessary Evil – How to Fix Finance by Saving Human Rights” is just published by Oxford University Press. Warum steigen die Löhne nicht? US-Staatsanleihen: Das Ende des Bull-Marktes? Wie akkommodierend sind die US-Zinsen heute? Wird sich die Wirtschaft jemals wieder erholen?